Masud Muhammad (1919 – 2002) was a Kurdish philosopher, thinker, linguist, and critic. He was born in a famous Kurdish family in Koya; his father was a prominent religious scholar who known as Mullah The Great (Maly Gawra). Mullah the Great was a religious reformist and has new interpretations to the Quran. He sees men and women as equals, and he encourages people to send their their children, particularly girls, to school. He is a pioneer in this regard. He sent his daughter Naciba Xani Jalizada to school and was seated with boys, while nowadays the boys and girls schools are seperated in Kurdistan. Masud Muhammad graduted at the College of Rights in Baghdad in 1945. He was a co-founder of the Kurdish Knowledge society (Kori Zanyari Kurd) in 1970. Masud Muhammad, Shek Muhammadi Khal, Aladin Sujadi, Hemn and Hazhar Mukriyani are active members of the society (Kor). They worked on Kurdish culture, literature, language, and history. The Kor published many books, articles and essays on topics that were related to Kurds. It published a quartarly journal ‘Kori Zanyari Kurd’. 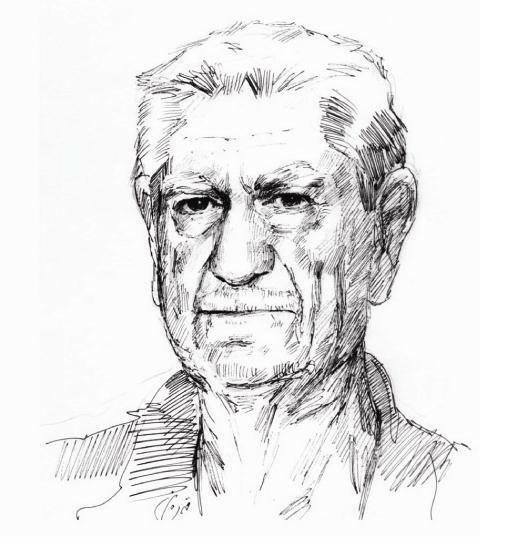 Masud Muhammad was tremendously active in the Kor and published several books and articles about Kurdish language, literature, and classic Kurdish poetry. He attempts to interpret Kurdish culture and society in a humanist pointview. He applys archeological and etymological methods to analyse and interpret Kurdish society and culture. Masud Muhammad interprets everything according to humans. Therefore humanity is a centre for his philosophising. To Mikhail Gorbachev With Greetings, [Bo Gorbachev]1988. Masud Muhammad lived in a time in which ideologies such as marxism, communism, Ba’athism and nationalism dominated Iraqi and Kurdish society. Everyone identified themselves through these ideologies while criticising and demonising other peoples’ ideologies. They identified themselves and the other by their ideology, not as fellow human beings. There was a restricted conflict between communists and nationalists at the time. Masud criticises the extremists in both parties. All ideologies, such as Marxism, nationalism and Ba’athism in Iraq work on dehumanising and instrumentalising humans and attempt to turn Iraqi society into a shapeless mass to control the people and make them more loyal to these ideologies rather than to their own lives and interests. These ideologies lead to conflicts between different ethnic groups, resulting in mass killing and genocide such as the Anfal Campaign against the Kurds in 1988. Masud Muhammad had lived in such situations where there are many conflicts between these ideologies. If someone did not belong to one of them, he or she will face many difficulties and threats them. Masud Muhammad, through the promotion of an anthropocentric philosophy, confronts these ideologies, and he attempted to rehumanise Iraqi society and specifically Kurdish peoples who had been destroyed, defeated and dehumanise by these ideologies especially Ba’athism. Masud Muhammad also criticises marxism, materialism and nationalism because of their manners towards humans as instruments for use in the appropriate way in which they can get what they want from you. He stands up against those ideologies and strives to empower Kurdish individuals and give them free reign to enable them to make decisions and have moral responsibilities. His main concern is about humanity and their rights. He considers human beings as rational beings who have free will and moral responsibility for their decisions, choices and actions. Masud Muhammad’s point of departure is the relationship between humanity and its surroundings or humanity and nature. He asks that in the formula or equation of human plus nature which one is influential, does matter or nature affect humans, or vice versa? According to Masud Muhammad the universe, nature, human and suroundings are all linked together and are integrated despite their differences. The question is: what is the nature of this relationship? Are humans slaves to matter and nature or vice versa? Do humans have free will? For Masud Muhammad, humanity is not determined and not a slave of matter, because humanity has free will. Therefore he criticises the matrialists who see matter as supriour to humanity and dispossess human of their free will. Masud Muhammad makes a distinction between three different worlds. First, the world of matter which humanity, animals and everything in the universe share. Secondly, the world of organisms which is related to animals and plants or any living thing. Humanity and animals share this world because they are living bodies. Thirdly, the world of humanity, all humans and only humans share this world. According to Masud Muhammad, the latter is superior because humans are superior as a result of being rational. Rationality breaks humanity from animals or plants. Masud Muhammad also makes a distinction between two kinds of change, biological change and social change. Biological change is related to the world of organisms. Humans share this feature with animals and plants. Humans also have biological changes in their bodies which are not under their control. Social change, on the other hand, is only related to the world of humanity, because social change is a production of rationality whereas biological change is a production of vitality. According to Masud Muhammad human is rational, subjective, social and free. Humanity is different from matter, animals and plants because humanity is rational, so rationality is an essential feature of humanity. The ability to reason is a source of thinking, understanding and invention. The rational capacity of humans leads to thinking about surroundings and events, either natural or artificial, and to understand the world. Also, humanity is subjective, and individuals who differ from other people have a great role in history. Humans are also social beings because they live with other individuals and its inventions and thought are a product of interactions with others within society. Humans also have the capacity for free will and to make decisions, choices and take moral responsibilities. For Masud Muhammad, humanity is intrinsically free, and freedom is natural, vital and essential to humanity. Therefore, humans must not be deprived of their freedom under any circumstances. To conclude, Masud Muhammad places a great deal of emphasis on humanity, and he promotes an anthropocentric philosophy to empower humans who are deprived of their freedom, moral responsibilities, choices and actions by dominant ideologies.